PreSonus today announced that Studio One 3, the most significant update to its powerful, easy to use digital audio workstation, is now shipping. Available in Artist and Professional editions, version 3 adds true innovations in song arranging and experimentation, as well as inspiring new ways to craft unique and evocative sounds. In addition, Studio One 3 opens users to new ways to control and mix within the application as the first DAW to offer a dual platform (Mac and Windows), multi-touch interface. Furthermore, Studio One 3 Professional users now have the freedom to create away from the desk through Studio One Remote for iPad. The new Studio One promises to look as good as it feels, with a sleek, modern, configurable UI for high-resolution displays. Studio One 3 Professional introduces the Arranger Track, which makes it easy to build and rearrange songs, letting you copy or move entire song sections with simple drag-and-drop. It has its own Track Inspector that shows all sections of the song, which also doubles as a quick navigation tool for your song. Unique Scratch Pads, also in Studio One Professional, provide an independent parallel timeline that lets you safely experiment on alternate ideas without jeopardizing arrangements. Simply drag Arranger sections, individual content, or entire songs into the Scratch Pad, make edits, then drag it back to your main song. Unlimited Scratch Pads can be saved with your project, saving you the trouble of numerous alternate song files. The updated Browser, found in both Artist and Professional, makes it easier than ever to find the content you’re looking for, with tag-based “musical” search. You can now search for loops, samples, and presets by typing keywords like “genre” and “instrument” or by filtering content by selecting tags. The Browser also now has an integrated Cloud tab to access additional content online. Extended FX Chains, new in the Professional version, provide new ways to build complex, multi-dimensional sounds by chaining and combining effects plug-ins in serial, in parallel by channel, or by frequency with up to five splits. Also new in Professional, Multi Instruments allow you to combine multiple instruments as layers or splits in a single Instrument Track and play them like one instrument. Further dimensions can be added to a sound by using Note FX on individual Instruments layers within a Multi Instrument. Note FX is a new plug-in type introduced in Studio One 3 that adds life to Instrument tracks by processing their note data. The four Note FX included with Studio One 3 Professional are Arpeggiator, Chorder, Repeater, and Input Filter. Each console channel and Multi Instrument in Studio One Professional now offers Macro Controls, which allow individual instrument or plug-in parameters to be assigned to control knobs, switches, and X/Y pads for easy access. Multiple parameters can be assigned to the same control with independent settings for range/polarity/curve. Studio One version 3 features a powerful new instrument engine that drives two new instruments. Mai Tai is a polyphonic analog modeling synth for modern electro and bass sounds. Mai Tai’s sounds can change character and produce drastic morphing changes and unique timbres. Its Multimode filter offers sounds ranging from vintage analog (a la Moog or Oberheim) to state-of-the-art, zero-delay feedback filters. Mai Tai’s oscillators and LFOs have a free-run option, like an analog synth. And you can build enormously complex sounds with modular-synth-style operation through Mai Tai's 16-stage modulation matrix. Presence XT is an expandable, full-featured sampler with a comprehensive sample library that covers all the bases. It offers disk streaming for large samples, and many sounds utilize articulation key-switching, scripting, and custom controls for unique sound parameters. Studio One 3 Professional includes a 14 GB sound library for Presence XT and can read popular sampler formats, including EXS, Kontakt, Giga, and SoundFont without conversion. Studio One 3 is now available in Artist and Professional versions, as both upgrades and full programs, at music retailers worldwide and direct from PreSonus. 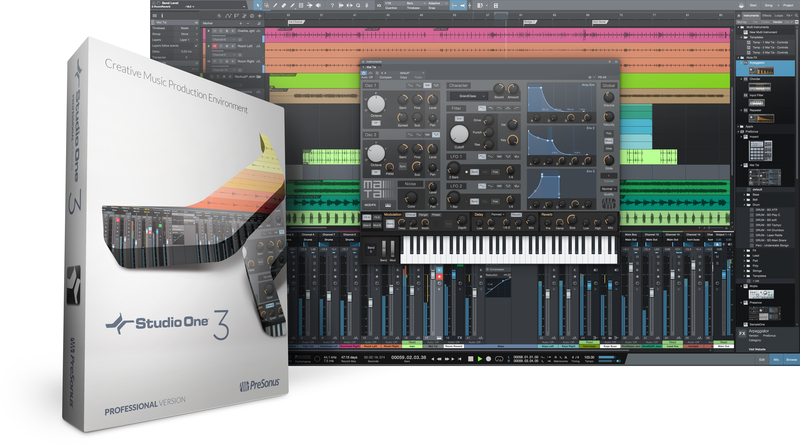 In June, PreSonus will also introduce Studio One Prime, a fully functioning free version, which will provide a great way to get started with Studio One. For more information on Studio One version 3, including complete feature comparisons, please visit the Studio One 3 Web site.